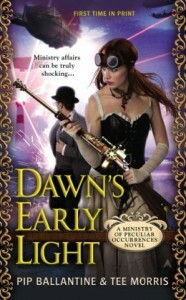 I recently caught up with them on their blog tour for Dawn’s Early Light, and asked them about the new book, how the series has transformed since the first novel, and how their working relationship has changed. ME: Give us a brief thumbnail of the action this time around. How does Books “promotion” to field agent changed his dynamic with Eliza? TEE: Dawn’s Early Light starts off with a foot chase. Books finds himself in the thick of it, and he is turning to Eliza for guidance, a complete opposite to what he is accustomed. Books has been the one in charge. Well okay, in charge on paper, deferring to Eliza on matters requiring action and deering-do. Now, she’s the primary agent on this case, on account of experience. Books is trying to remain the voice of reason, but he needs Eliza to get him through this transition. It was something we played with throughout the book, and it was great fun. ME: You have allow many authors to share in your universe in the “Tales from the Archives” and “The Ministry Protocol” anthologies. How have these stories influenced your canon, or served as inspiration in your novels? TEE: We owe a lot to one author in particular — Jack Mangan. Jack was the author who created the Agents of O.S.M. (pronounced “Awesome”) which he did as part of the whimsical nature of his short story, “Night’s Plutonian Shore.” Both Pip and I knew we wanted to re-visit O.S.M. and so we did in this book. 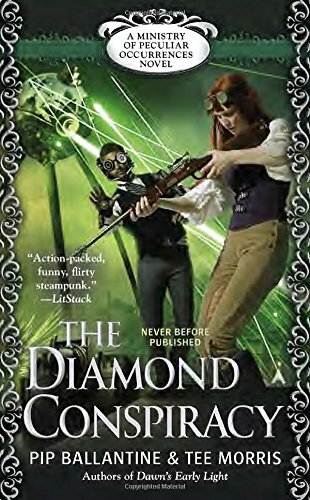 In the next installment—traveling under the working title of The Diamond Conspiracy—many of our stable of authors from the short stories are making appearances. As this is our world, we regard the short stories of both Tales from the Archives and Ministry Protocol as canon. It’s our job as the editors to make certain guest authors stay within the parameters of our world, and what our colleagues have created has been a real delight for us and for fans of the series. ME: Do you draw story ideas or characters from history, and if so how are these reflected in your series? PIP: Playing with history has always been something that we’ve done in our works. I first drew inspiration from Shakespeare in Chasing the Bard while Tee set Morevi in King Henry’s court and The Billibub Baddings Mysteries in 1920’s Chicago. With steampunk, the incorporation of history is seamless, but we really didn’t start reaching to the historic celebrities until The Janus Affair when we featured Kate Sheppard, leader of women’s rights in New Zealand. Unintentionally, we’ve got an all-star cast of historic inventors in Dawn’s Early Light, but we are thrilled at how well it all works. We are also inspired by the cities we visit, and Detroit made a wonderful impression on us. That is a city rich in history. ME: Are the Ministry novels part of a larger story arc, or are they written as stand alone adventures? 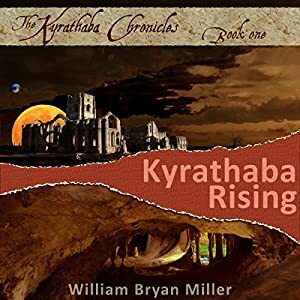 TEE: The adventures themselves—Phoenix Rising, The Janus Affair, and Dawn’s Early Light — are all stand-alone adventures, but running underneath all three books is a sinister sub-plot that reaches a head when Books and Braun reach America. Can you pick up the series with this book? Yes, you certainly could, but you will miss out a few of the details we feature in the earlier books. The good news is when you finish any of the novels, you also have the short stories to explore, and then you can re-read the novels and catch delightful nods to the podcast throughout each. ME: How has your collaboration changed since “Phoenix Rising,” and what impact has it had on your solo writing? 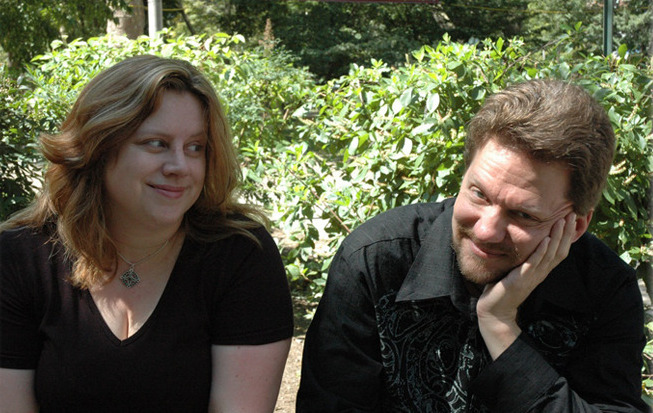 PIP: When we first started writing together, we were in different hemispheres. The production was brilliant as I would write and edit while he would sleep; then we would switch when it was time for me to sleep. The problem with that was bouncing off ideas which happened quickly as we only had a small window in the early morning and late at night to talk via Skype. Now, we are able to talk out situations, problems, and plotting. He’s there for me to bounce off ideas from, even in my solo work. He’s nice to have about. I think I’ll keep him. The Party Continues Here with prizes and favors below! And, what’s a party without a goodie bag!